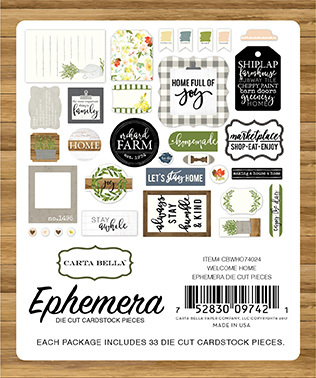 This package contains an assortment of thirty-three Ephemera Die Cut pieces. Great for accenting and embellishing any of your craft projects. Look for coordinating Designer Papers, Chipboard Elements, Enamel Dots and Designer Dies. Part of the Welcome Home Collection by Carta Bella.